YESTERDAY BRITISH AIRWAYS announced they would be buying Airbus aircraft from the A320 series. Previously they bought mainly from Boeing but the decision to buy European was, they said, a purely commercial decision. The wings for the Airbus series are constructed in the North West, and flown to the Airbus Industrie assembly plant in Toulouse France. Many jobs in and around Manchester will be secured by the order, and there was jubilation at British Aerospace Chadderton, and at other plants around the region. 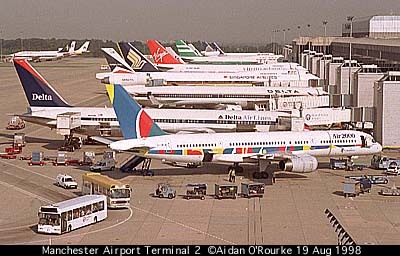 Terminal 2 with a colourful variety of planes, including Virgin, Pakistan International, Singapore Airlines, Delta and Air 2000, a Manchester-based charter company. This is the view from the top level of the main multi-storey car park. In this panorama we see the upper level of the newly extended Terminal 1. Visitors can get a superb view of the apron from the front of the terminal. I wish Terminal 2 had a view as good as this. Skylink is an oval shaped tube equipped with moving walkways, allowing people to move quickly, well, fairly quickly, between Terminal 1 with Terminal 2. It's great for experimenting with unusual photographic effects, but I wish the walkways wouldn't keep breaking down! Everything in this picture except the Control Tower and adjoining block centre left has been constructed this decade. On the left is the domestic terminal, and behind where I'm standing is the new British Airways Terminal. A CONSIGNMENT OF BLANK PASSPORTS arrived at Servisair Cargo, Manchester Airport last week. A man came to pick them up, signed for them and took them away. Two days later an official, presumably from the Pakistan Consulate, arrived, and it was discovered that he was genuine and the first man was bogus. Greater Manchester Police Inspector Ian Otto told BBC's Northwest Tonight that the scam had "been executed quite well". An investigation has been launched, but the passports are now missing, and may be sold on the black market. But what use is a Pakistani passport in Britain without a valid visa? Maybe those are on sale from another source. "WHERE'S THE SUNNY WEATHER GONE?" said an old man I was chatting to this afternoon. At the time it was cloudy, but by late afternoon, sunshine and blue skies had made an appearance. Let's hope they stay for the bank holiday weekend. "With regard also to the popular error, of the county being singular as a depository of excessive rains, this is capable of the most palpable refutation, by reference to the meteorological observations of the average quantity of rain fallen in many other districts of England". I couldn't have put it better myself. Current EWM temperature 57/14.